According to the Singing News, former Florida Boys pianist Derrell Stewart was transported to the hospital in Florida West Florida Hospital (how’s that, Daniel? <g>) via ambulance. Stewart has had several blackout episodes and is currently undergoing testing in the Cardiac Intensive Care Unit. Stewart is another in an increasingly smaller list of SG legends that are left. Please pray for Derrell and his family. We stopped in Dollar General the other night to pick up some supplies and some cheap birthday cards (DG is a WONDERFUL place for greeting cards!) and while we were browsing around, I was looking through the CDs and DVDs. Since I found the Johnny Cook CD a while back, I peruse the stacks everytime I’m in there. Lo and behold, I found something else that was quite interesting. Dollar General is selling a 6 volume DVD set of the Gospel Singing Jubilee. These are not the Gaither issued DVDs, but are entirely different. Here are the six volumes, I only found volumes 1 and 6 at my local store. I will have to say I was disappointed in the Florida Boys DVD. After about the second or third song, the audio began lagging about a second behind the video, which made for some aggravating viewing. However, this was not a problem on the Speer Family volume, and it was very enjoyable. Hopefully my copy of the FB is just messed up. Oh, the DVDs are very reasonably priced as well….2 for $10. Gotta love DG prices! Has anyone else seen these and/or picked them up? Also, one of the Florida Boys cuts has a tenor I don’t recognize. The song appears to be from the early 80’s, and the tenor is short, a little on the stocky side, and has dark, almost black hair. It isn’t Jerry Trammell, it isn’t Terry Davis, and it doesn’t look much like Greg Shockley. Anyone know who this tenor is? As a tribute to the late Billy Todd, here’s a nice cut of this old spiritual that features Todd. This particular song comes off of the Up Tempo album that featured Tommy Atwood, Les Beasley, Glen Allred, Todd, and Derrell Stewart. The Florida Boys do this song a bit slower than most, but the slower tempo really showcases Todd’s incredible vocals. This song allows Todd to show off his upper and lower registers, and he handles his solo lines effortlessly and flawlessly. Billy Todd had great cut on his lower notes, but could also jump up to the higher notes with just as much ease. If you have this album, pull it out and spin up this track, and enjoy the great bass singing of one of our most underrated singers ever. 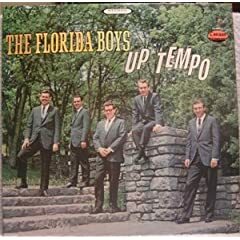 News broke yesterday that Billy Todd, longtime bass singer for the Florida Boys and most recently, the Dixie Echoes, passed away after a battle with Alzheimer’s. Billy Todd was one of the most underrated bass singers that SG has ever had. Todd sang with class and dignity, and had a tremendous bass voice that was deep, full, and rich. We have truly lost another legend from our midst, but as always our loss is Heaven’s gain. Condolences go to his family, it’s especially hard to lose someone during this time of year. Funeral arrangements are posted on the Sinigng News site. This is the chorus to a song called “The Fire Song” recorded by the Florida Boys on the album Up Tempo, which is one of the LPs I picked up in Branson. Don’t get me wrong, the song is performed expertly, and it is really catchy. I just can’t get over the lyrics on the chorus. And to be honest, the FB’s sound just a bit too happy while singing the lyrics “when the world’s on fire.” Just thought these were some of the more bizarre lyrics I’d ever heard. I spent this past weekend in Branson, MO with my wife for our 6th anniversary. Before we left to come home, I was able (after much begging and pleading) to convice her to let me hit a couple of flea markets/antique malls to search for some records. I came home with about 10 LPs, including the ones pictured below, that I am particularly happy with. I’ve not heard any of them, so comments about them are more than welcomed!